This shorebird breeds across northern Asia and Europe and winters from Ireland to southeast Asia. 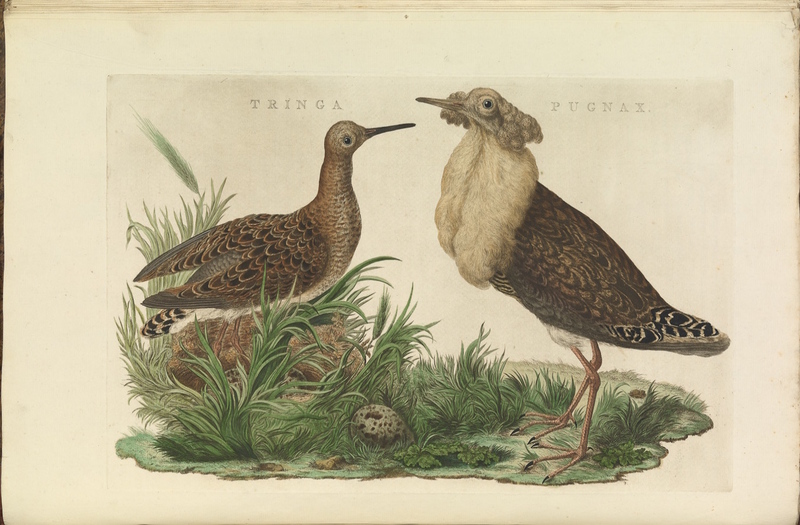 No other wild birds show as dramatic individual differences as male Ruffs in breeding plumage. They are mostly silent. Ornithologists believe plumage variation helps them recognize one another without vocal cues.They erect their head and ruff feathers when gathered on leks. The much smaller female looks so different from the male that it’s traditionally given another name, the Reeve. Both sexes have tiny heads, long necks, and a potbellied body, giving them a distinctive shape some liken to a gravy boat. Ruffs migrate in large flocks, but some individuals wander widely; vagrants have been found throughout Canada and the U.S., Central and South America, Madagascar, and New Zealand. Laura has seen the species once in Minnesota (in 1983), and in Austria and Uganda. She also probably saw one when she took an ornithology class at Michigan State University in Spring 1976. The teaching assistant leading a morning field trip identified one that Laura got excellent looks at, but she didn’t count species she’d not have been able to identify on her own.